Q. What books would you recommend if I am interested in identifying American silver flatware patterns? Q. I am interested in California silver, makers and their marks. What do you recommend? Q. Grape patterns are so lovely. Is there a book that deals with this subject? Q. Is there a good book showing the values of flatware items in various patterns? Q. Are there books on specific American silver companies? Q. 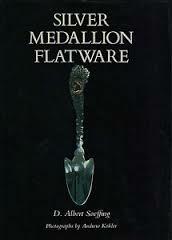 Are there any books on Medallion flatware patterns? Q. Are there any books dealing with English silver marks? Q. Where can I learn more about sterling silver, silver plate, or coin silver maker’s marks? I have a piece I can’t identify! To identify sterling patterns I would recommend Sterling Flatware by Tere Hagan. Either the Second or Third Editions, Revised, will do. What I like most about this book is that patterns are hand-drawn illustrations (not photographs!) of pieces with the usual too dark, too light, light reflecting off the surface and other problems associated with photographing silver. As is usual with so many of the really good books on silver, it is out of print. Fortunately, Amazon.com generally has one or more copies, which can be found at this link. At present, the Second Edition, Revised is available between $2 - $30. To identify silver plate patterns I recommend Silverplated Flatware by Tere Hagan, Fourth Edition, Revised. It has the wonderful hand drawings just like her sterling book. And, again, like the previous book, available at Amazon by clicking here. At present, the Fourth Edition, Revised is currently available from $2 - $12! American Silver Flatware 1837-1910 by Noel D. Turner. It is not the best book on identifying patterns but Turner does a fine job on sterling and silver plate patterns up until 1910.He shows patterns and, with multi-motif patterns, shows examples of variations within the pattern. There are wonderful sections with pictures showing the original functions of pieces. Pictures of presentation sets are detailed, patented pieces, infant and children's items are featured. There is a lot of space devoted to makers and their marks. It is the only book I have come across that shows the year a piece when a particular functional piece came into existence. Examples would be ice cream spoons, ice cream forks, strawberry forks, terrapin forks, asparagus servers, etc. Samples of Victorian table settings with proper placement of pieces on the table is wonderful. The list goes on and on. It is truly the bible of American silver flatware prior to 1910. A. Silver in the Golden State: Images and Essays Celebrating the History and Art of Silver in California by the Oakland (CA) Museum History Dept. The photographs of California silver flatware and holloware are superb. The history of the gold rush, Comstock lode (silver) including the equipment and key people involved is fascinating. This is the best book as far as illustrating California flatware patterns of silver and California makers' marks. Q. Grape patterns are so lovely. I really like Moselle, Vintage, La Vigne, La Concorde, Cloeta and other patterns with grapes. Is there a book that deals with this subject? 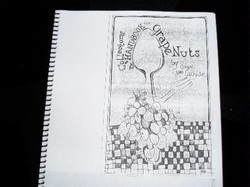 A. Collectors' Handbook for Grape Nuts by Suzie MacLachlan. It is expensive, however, and quite rare. Expect to spend $100+ to get a copy. The books shows thirty-odd grape patterns, going into the various pieces available in certain patterns such as Vintage and Moselle. There are excerpts from old catalogs showing ads, prices, options, etc. Here is an alternate cover for Collectors' Handbook for Grape Nuts by Suzie MacLachlan. Admittedly, there's a bit of a charm to this volume, as it was printed in 1971, obviously done in the vein of various home-created cookbooks. The rage for grape patterns was from 1904 to about 1918. Today, many collectors enjoy the beauty and realism of these pieces. The decorations in the bowls of berry spoons, grapefruit spoons, gravy ladles, and near the tines of cold-meat forks is breath taking. Overall, it's THE guide you'll need if you're a "grape nut," as well. A. In my opinion, no. Some authors such as Tere Hagan grouped patterns by a rating system of collectability and showed the values of functional pieces within that category. Many functions are not included and, in general, the values for the most desirable patterns such as Holly, Moselle, Arcadian, Charter Oak, Floral and Vintage are understated. The list by now is also well out of date. Most authors undervalue pieces such as salad forks, iced tea spoons, pie forks, ice serving spoons and other rare pieces in patterns that were discontinued by 1918. Examples would be iced tea spoons and ice cream forks in Holly, Moselle, Vintage and La Vigne. Another example is hollow handle knives in La Vigne. Flat, one piece construction knives are common and hollow handle, two piece construction knives are rare and worth $100+ each. With the tens of thousands of pieces of silver I see in a year, it is uncommon to see an iced tea spoon in Vintage or Moselle or a hollow handle knife in La Vigne. I can sometimes go a decade without having the opportunity to even see these pieces! Gorham Silver 1831-1981 by Charles H. Carpenter, Jr. Both are fabulous books that delve deeply into the history, patterns, marks and so much more of these two wonderful American silver manufacturers. Both are out of print and available at Amazon. A. Silver Medallion Flatware by D. Albert Soeffing. It goes into the dozens of Medallion patterns that were the rage in the 1860's and 1870's. This interest in the excavations of Herculaneum and Pompeii inspired a revival of the Greek and Roman designs and was reflected in the china, silver, rugs, wallpaper, etc. of the 1860's and 1870's. These are some of the most beautiful of American silver flatware patterns and many resemble intricate cameos. The Book of Old Silver by Seymour B. Wyler deals with England, Scotland, Ireland as well as France and Germany. It goes into the history of the guilds, makers, marks and one can use the book to date a piece, locate where it was made, determine the maker, and reigning monarch at that time. The quality of the metal can also be ascertained. Last I checked, it was still in print and could be obtained from your favorite book store or Amazon. Jackson's Silver and Gold Marks of England, Scotland and Ireland edited by Ian Pickford. This is an extremely well-done book that is the clearest I have found on the subject. And, unlike most, the book is still in print. There is also a less-expensive paperback version here. I would recommend this for the serious collector. A. 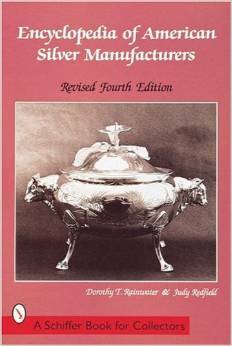 If you have an interest in American silver marks, I recommend Encyclopedia of American Silver Manufacturers by Dorothy T. Rainwater & Judy Redfield. There are vast numbers of books on American silver manufacturers, their makers' marks, histories, etc. If I could only have one for marks, this is the one I would pick. While no book covers all the makers, this one comes the closest. There is a nice section in the back of the book of titled "Key to Unlettered Marks" that shows symbols and marks and the manufacturers that these represent. I like the alphabetical listing of Trade Names also in the back of the book which shows what manufacturers go with what trade names. It is a big help to me. Another nice touch is the listing of letters and symbols by makers such as Gorham, Reed & Barton, Whiting, Tuttle, etc. that provides a key to Year/Date marks. One looks at the symbol on the piece of silver and the book provides the key to the actual year of manufacturer. A. 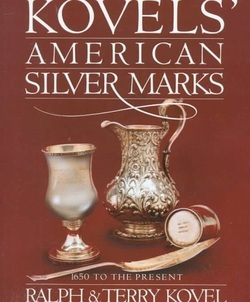 For identifying coin silver makers, I recommend Kovels' American Silver Marks by Ralph & Terry Kovel. This book does a good job of covering the marks from many American coin silver makers. Once again, no single book covers all. On a certain percentage of coin makers, there is simply no data available, and one may quickly hit a dead end in the quest for data on that particular silversmith. The Kovel's do a fine job of showing the names of the makers, cities where they worked, years they were in business, partnerships with other silversmiths, birth and death dates of many of the individuals. They even also have year/date marks on a number of the makers. My favorite book for coin marks! NOTE: Not all American companies used year/date marks. In fact, most did not, and only used the marks on larger pieces such as hollowware while others marked both hollowware and flatware. Tuttle, for example, did both. Some companies used these marks only for certain periods of time but it is handy to have them, regardless of the book. Match the pattern on the front of the handle of your piece with the picture in the book. There is a price guide in the front of the Silverplated Flatware book.